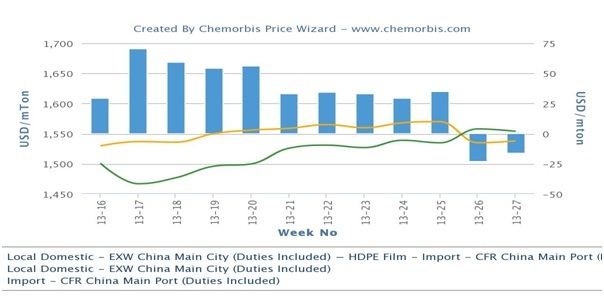 In China, overseas producers initially approached the market with firm July import PE prices last week pointing to higher costs and limited availability as per the pricing service of ChemOrbis. However, this week, a Middle Eastern producer stepped back from their hike requests for July after meeting resistance from buyers. This was partly due to softer prices in the local market, where effects of the new capacities in the country dampened sentiment. As can be seen from the graph below, while import prices were announced higher for July, the losses witnessed in the local market over this past week caused import prices to carry a premium, hampering buying interest for imports. A South Korean supplier rolled over their July HDPE film prices from June last week, with the producer’s prices standing at the high end of the overall import range. “Our prices are above the prevailing market levels as we have a limited allocation. We received several counter bids around $50/ton below our prices,” a producer source said. 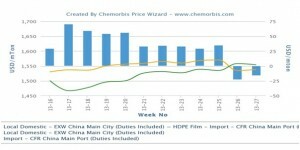 In the local market, PE prices are down CNY50-200/ton ($8-33/ton) from last week as the impending start ups of new PE plants continue to weigh down sentiment. Wuhan Petrochemical, a joint venture between SK Group and Sinopec, began test runs at its PE plants in Wuhan City, Hubei in the middle of June and commercial runs are slated for mid-July. The two HDPE and LLDPE plants each have a capacity of 300,000 tons/year. Sichuan Petrochemical is also planning to start up two PE plants, with a combined capacity of 600,000 tons/year, in August. The company started test runs in the middle of last month and it was expecting to reach commercial runs in July.